Healthy Chocolate Frosting?! Yes, you read that correctly. 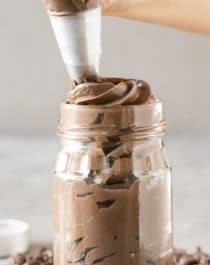 Unlike storebought frostings and icings, this sweet and creamy, uber chocolatey dessert topping is made without the refined white sugar, hydrogenated oils (or trans fats), artificial flavorings, and preservatives! Perfect for frosting, saucing, dipping, and digging in with a spoon ? This Chocolate Protein Frosting is great as a frosting, a fruit dip, and so much more. Ohhhh yeah. I could eat this stuff alllll day. Breakfast, lunch, dinner, and dessert? Totally. I say, “YES!” to them all. Top off cake or cupcakes, even pancakes and waffles! Buttery rich, and thick and creamy? Check. Healthy, wholesome, and all-natural? Check. One bite and you won’t believe this frosting is sugar free, low carb, low fat, high protein, and gluten free too. But it is. For realz! In a stand mixer bowl fitted with a whisk attachment, add the yogurt, cream cheese, vanilla paste, and stevia extract. Mix on medium speed until completely smooth. Scrape down the sides of the bowl and mix again. In a small bowl, whisk together the protein powder, erythritol, and cocoa powder. Turn off the stand mixer and add the dry ingredients. Mix on low speed until incorporated, then increase mixer speed to high. Scrape down the sides of the bowl. Mix on high speed for 3 minutes. Scoop into an airtight container and refrigerate to store. Refrigerate for 4+ hours (preferably overnight) before frosting. Enjoy! I adapted this recipe from my Vanilla Protein Frosting. Almost every frosting recipe is full of butter and powdered sugar, so I made my own version. I opted for a cream cheese frosting that is secretly high in protein and low in fat. But the taste and texture is practically identical to that Pillsbury “stuff.” This frosting was a HUGE hit in my house, so of course I needed to make it again. And again. Over and over. That Vanilla Frosting and this Chocolate Frosting are both staple foods for me ? Sugar, Water, Partially Hydrogenated Soybean and Cottonseed Oils, Corn Syrup, Cocoa Processed with Alkali, Corn Starch, Salt, Sodium Acid Pyrophosphate, Mono and Diglycerides, Natural and Artificial Flavor, Polysorbate 60, Modified Corn Starch, Potassium Sorbate (Preservative), Soy Lecithin, Citric Acid, Artificial Color. Why choose that crapola when you can have my lovey-dovey Chocolate Protein Frosting? ? My healthified version has just 110 calories, 0g trans fats, just 3.5g of naturally occurring sugars (no sugar is added), plus 10g of protein! Mmmmm. Do you have any idea how hard it is to make an icing like this and eat it immediately after for taste-testing purposes?? I love my job ?